The best valued, cleanest and cheapest hostel in the absolute heart of Veliko Tarnovo. Other hostels claim many things but we actually deliver. We will match or beat any Veliko Tarnovo hostel price. See it for yourself. Clean, comfortable and fun! Meet heaps of people in our lounge, dining room or the balcony with the best view over the city. A splendid opportunity is to enjoy the stunning spectacle Sound and Light either from your room or the balcony, overlooking the fortress. By means of audio-visual effects it represents episodes of the 7000-year history of Bulgaria, enlivens the fortress of Tsarevets, thus magically carrying you back to centuries gone by. And as soon as you step outside you're only minutes walk from the museums, monuments, bridges, cinemas, city parks, Samovodska Charshia Square, restaurants and cafes, night clubs - how much time have you got? Conveniently, all major banks, ATMs and government offices are also extremely close by. There's a fully equipped kitchen, a dining room, internet access, a laundry and a comfortable lounge to make this a home away from home. At Hikers Hostel you'll have every convenience you need to make your stay carefree. Comfort and enjoyment, cleanliness and friendliness, free internet and free wireless, our helpful staff works everyday to provide a superior level of service so your visit to Veliko Tarnovo will be most enjoyable and special. And all the Fun you can take! A stop station for backpackers, adventure seekers and random travelers. The hostel is designed to provide the appropriate environment for travelogue exchange and to offer alternative travel routes. The purpose of our attempt to share travelogues in a multi-national ambience is to broaden horizons and enrich both the novice and the experienced traveler. This initiative is designed to gather together contributors to a new vision of alternative travel and as such it will constantly be in progress. 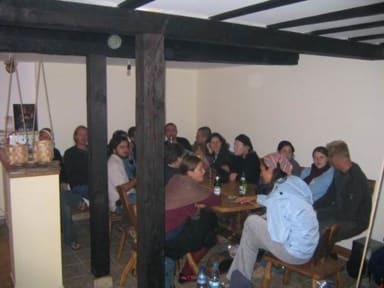 Hikers Hostel is located in Veliko Tarnovo, a town once proclaimed the capital of the Second Bulgarian Kingdom and for many years, it has been a centre of political and spiritual life. Veliko Tarnovo of today has managed to preserve the atmosphere of this glorious period almost intact. On account of its cultural and artisan heritage and its mid-point in Bulgaria, the town is the perfect home for Hikers Hostel. It is designed to provide the appropriate environment for travelogue exchange and to offer alternative travel routes. 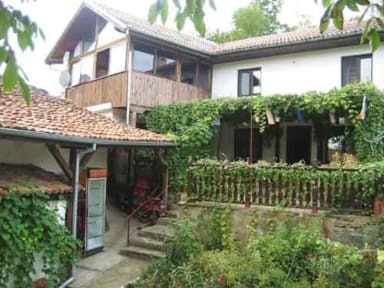 Hikers Hostel is positioned in the most attractive but peaceful area of Veliko Tarnovo - the Samovodene Marketplace, which is dedicated to Bulgarian arts and crafts and is within walking distance of the town centre. The two-storey hostel is in the vicinity of this unique street and offers a wondrous panoramic view towards the three historic hills - Tzarevetz, Trapezitza, and Sveta Gora. It's the first hostel in town with the most experienced multinational stuff. We enjoy making BBQ parties in our yard/garden and we have learned that our guest love it too. And you are welcome. Join us! Feel warm and welcome while exploring the night life with us in this young student town. We would love to take you for a pub crawl and show you what is good and what to avoid in the night. We also offer you the opportunity to explore the beautiful mountainous area around Veliko Tarnovo. Day trips to numerous eco-trails, monasteries, ethnographical complexes, combined with pick-nick in the shadows at the many waterfalls on the way.